PEKIN, Ill. -- Braden Garnett's world is often a lonely one. Diagnosed early in life with Asperger's, dyslexia and a condition that causes the misalignment of his eyes, Braden is often the target of school and playground bullies. "I struggle because people are calling me names. 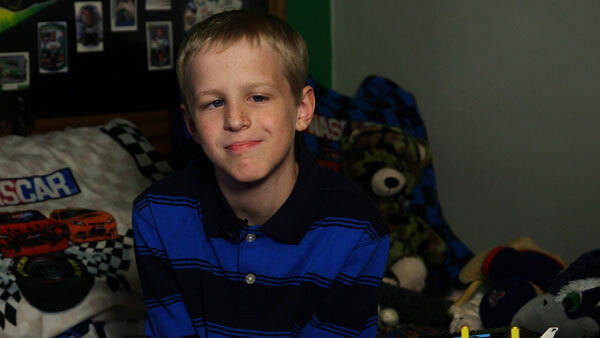 I'm bullied constantly," said Braden, a 5th grader from Pekin, Illinois. "Telling me I'm a cross-eyed freak, and I'm not good at kickball." School is hard enough, but every year when birthday time rolls around, it gets worse. "There have been many parties when only two kids showed up," Braden's mother, Carrie Garnett, recalled. "Other years, no one." This year seemed no different. For his 11th birthday, Braden had his heart set on a paintball party, and he invited dozens of boys from his school. As the day drew near, of the 36 classmates invited, only two RSVP'd "yes." Fearing the same sad, familiar situation, his mother decided to take matters into her own hands. 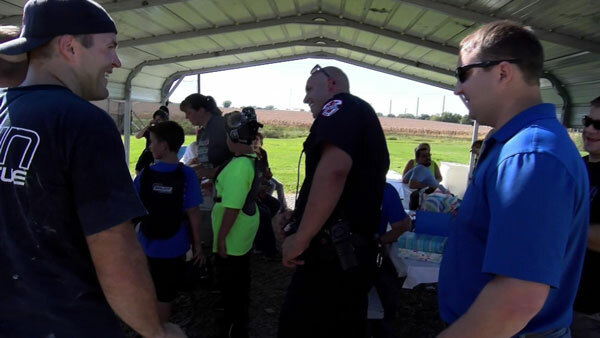 Carrie Garnett reached out to the Pekin Police Department to ask if an officer would surprise Braden at his paintball party. "I want him to have what all the other kids had. I want him to have all the good friendships and to not struggle," Garnett said. Her email landed in the inbox of Detective Mike Eeten. "That's a difficult thing to have to say to your child why nobody showed up to their birthday party. So I thought we can do this. We can help this child have a birthday party he'll never forget," Eeten said. Eeten quickly spread the word to other officers and the fire department, including Police Chief John Dossey. Braden's story stuck close to home for Chief Dossey, whose own son has autism. "I specifically remember the birthday parties where only one or two kids showed up," Dossey said. Inspired by Braden's story, many officers in the department were eager to show their support. "They were talking about this special kid Braden. How neat it'd be if we can go and surprise him at his birthday party," said Patrol Officer James Guerra, an 18-year law enforcement veteran. "A lot of times we're involved with seeing people at their worst. Or on their hardest days. To be a part of somebody's day, that was a pretty special thing." When the day of his party came, nothing could have prepared Braden for the surprise visit from his own all-star paintball team. More than a dozen police officers, firefighters, the Police Chief and even Pekin Mayor John McCabe showed up at the paintball place, ready to square off. Some of them brought their kids. They split into two teams, with Braden, and battled it out. The officers also pooled their money to bring presents, including a police station Lego set. The party even featured its own team mascot -- the K9 officer's dog. Braden was overcome with emotion by the officers' gesture. "I've never had that much people show up at a birthday party," he said. "It was a special moment to see a kid, who, sounds like he's got a rough go of things. Just my presence, just my police car, the lights, the uniform, to put a smile on his face, I mean, it was one of the biggest smiles I've seen in a long time" said Officer Guerra. Braden's mother said her son was smiling all day long. "There were no social struggles," she said. "The day was all about him and his happiness." For just one day, these officers helped Braden forget his daily challenges as well as their own. "It helps put things into perspective into why we're here. It's a bigger story, for him to be able to see just what police are here for," said Detective Eeten, fighting back tears. "We are people. Just like him. Real struggles, you know. Real feelings. And real families." The day after the party, Braden went to the station to thank the officers for making his birthday so special. What's next for Braden? He's not yet planned his next party because he's too busy getting ready for his career as a police officer or firefighter.